This post might help those still having problems, including the link in the post. 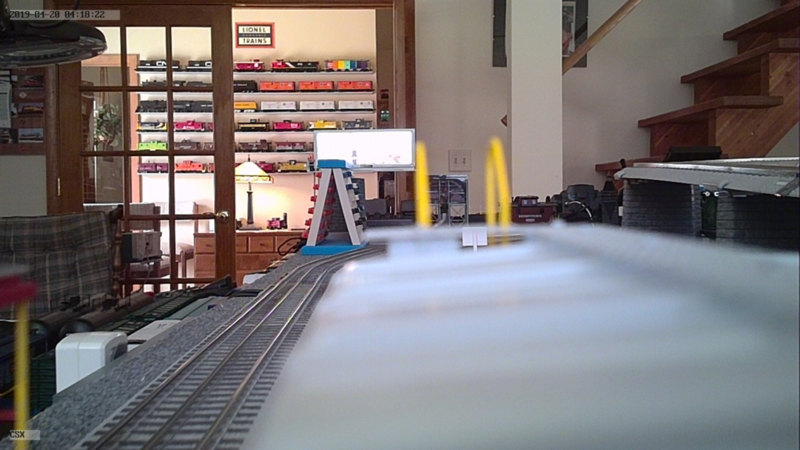 BTW, my CSX caboose has a sharp picture. Speaking on what I see on the screen here, I'm not even sure I would call that just blurry. There is a shadow frame/split image I'm seeing too. It could very well be reflections, but I wouldn't rule out rendering or lens issues. That one is "unacceptable" imo too. I might try pulling glass if not glued, a flaw in that does seem a likely cause too; nothing is in focus at any distance. I have one of those mini "spy" cameras you see at train shows. It has a lens that can be turned (threaded) to correct the focus, can the same be done to this camera? are same item and therefore should render they same quality picture. unless its not. I read a great book on the "Candy Bombers"
I agree with Matt. Connecting to your own wifi network is not explained. We ran tests on my new NS caboose this weekend and found the images very blurry. We decided to remove the window infront of the camera and the results were fantastic. The image is now very sharp. The window has two layers of plastic and was degrading the image. The catalog NS was shown with a black roof but my version was dressed in a silver roof. One of the middle side windows was not fitted with clear plastic. Did you happen to notice if that window was not very clear to look thru with your eye? or any defects in the window? or did it look like any other plastic window? just curious since removing it solved the problem. The window looked a lot like the others on the caboose. But looking through it you could see the image would be degraded. You have to be careful taking the caboose apart as there is a fair amount of wiring to be considered. We found the truck locations were not optomized to allow the four long screws to be removed easily. However the end result justified the labor. I am a photographer and spend thousands on very clear glass for my lenses. Model plastic just does not do the trick. Just wondering if anyone else has tried this removing the plastic window trick? I’m scared to try taking mine apart, but I’m not really thrilled with the image as-is from the camera. First let me say that I don't advocate for disassembly of the caboose. It is made to be easily assembled, not taken apart. Having said that, I just spent 45 minutes getting the thing apart and removing the window. WHAT A DIFFERENCE!!!!!! Once I get the thing re assembled I will post a picture or two. On the software note, I am using my PC (Windows 7 with FireFox default browser) and the IPCmultiview application to view the image. It works great!!! Still disappointed that my tablet cannot load the app but now that I have the PC working well, I am satisfied. This is a great product. Mucho Kudos to Lionel for bringing this to market. In the alternative....slightly press the side of the window with a small flathead screw driver. There is not much glue holding the window into the frame....it should pop the window into the caboose for safe keeping. 😜. This method saves you from screwing up any wiring or the hassle of removing the caboose from the frame. 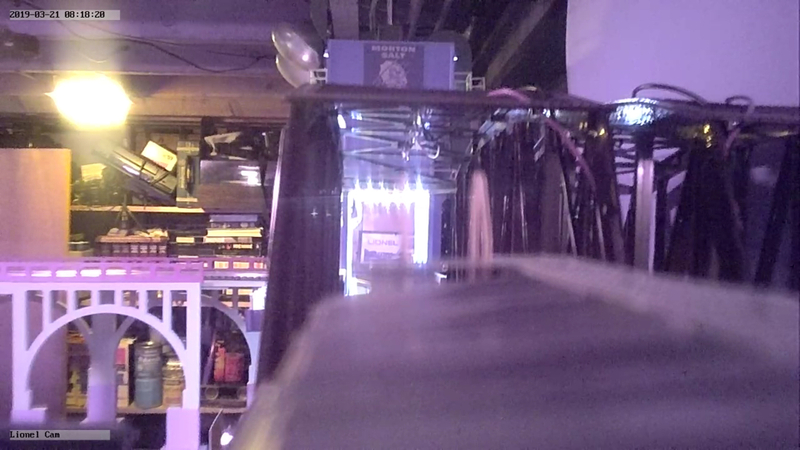 In my install, the camera was too close to the window to allow the window to drop away. So I had to take the car apart. Here is the picture I just took with the window removed. This is at max resolution. Before window removal the image of the writing on the transformers was just a blur. I'm wondering if the window is a widening lens. But of course if it's clouded, then what good is it? It could easily get clouded if the glue was sloppy. 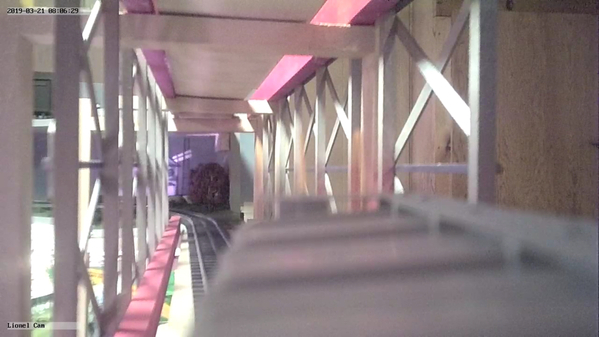 Or maybe adjusts the focus from infinity to something a bit closer for better caboose roof definition. I took a short video today of a short train with the caboose cam. One lap around the display table in my house. Looks good. Is that with the window installed or knocked out? Both the picture above that I posted and the video are with the window removed. I am experimenting with thin clear plastic in front of the camera now to protect the lens from dust. It is very dusty where I live and I don't want to have to break out my camera lens cleaning equipment for this caboose cam. Also I have to say that these cars are the most built into a corner of any toy train item I have ever experienced. I can't imagine how they got the screw under the one truck into the thing with the truck attached. At the least, you would have to remove the other three screws and then remove the last one under the truck while removing the frame of the car so the screw can stay under the truck as it comes out. And go back the same way. The trucks do not attach from the outside, there is a retaining clip on the inside to secure the truck. I managed to destroy the truck on the SF cam caboose (by pulling the mounting collar out of the truck...which does not seem to be swaged back in without a new unswaged collar) just to see how the heck the thing is put together. It would be nice to just remove the cupola, but the retaining arms are prevented of being pushed aside by the LED lighting strip. I ended up removing the camera assembly from the SF car which I actually had planned to do, and decide what car/engine I can put it into the front of so I can see everything going down the track. The camera assembly consists of a 5 volt regulator card, a switch, pushbutton, camera on a long flat cable and the camera microchip and antenna bundle. It would take some room...the most convenient would be a box car or some such with pickups on the trucks. Be nice to get it onto an engine, but not very likely unless ugliness is acceptable. Well it looks like my camera has shifted causing the off center view. I got to thinking that after examining the windows and they appeared to look identical and non lens like. My camera is very loose compared to the one is in the SR car that was difficult to remove. So if the camera doesn't shift, maybe removing the window is the way to go. Wow. Took the car apart...one thing is that you don't have to take the screws all the way out...just a quarter inch or so is sufficient to remove the frame and interior from the shell. The trouble from there is that the lead plugged into the top lighting LED strip is too short to remove the shell. So I pushed the side window out of the cupola on the side where the LED plug was and unplugged it with needle nose pliers. Then you can remove the shell to the point where the camera is still attached to the cupola but on a pretty long wire strip...and then remove the LED strip and then carefully the cupola from the shell. Glue the side window back in the cupola and the LED strip back and then you can put the shell back on the frame but wait til the end to tighten the screws and also repaint the side of the truck where the screwdriver knockered it getting the screw loose from under the truck . From there you can remove the camera window and make sure the camera is still square in the holder and that the holder is still glued to the cupola (which mine was not). Also then cut away a half inch of the the vertical strip on the back side of the retaining strips on the so the cupola can be snapped on or off when from the outside without having to remove the LED strip (and disassemble the entire car). Whew. Here are the results. Before and after, window off in both pictures but camera tipped on the "before" picture. By the way Lionel, how's this going as to getting spare parts? I notice the trucks are not available, will they some day? Any tips on how to professionally get this thing apart? I think he is just referring to panning the picture on the device screen without changing the view. At any rate, that's what happens when I follow the directions given above. My camera and camera holder was actually loose and just about flopping around. Now it's glued back in and good, but I don't think you could pan the actual view without panning the camera. of the it cannot be gently pushed, hence disassembly necessary. I do not think the road name makes a difference as to the ease of removing the window. We have two NS, one CSX and a Chessie. 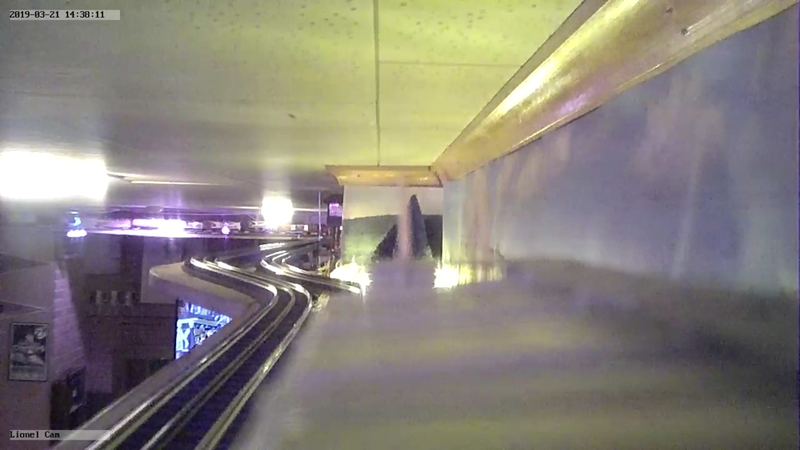 The CSX popped out without loosening the camera in its holder. The Chessie is fine without removing the window. Both NSs loosened the camera in their holder and required either popping the side window out or removing the cupola. We managed to remove the cupola on one of them without disassembling the entire car. The tabs that hold it on are in the front and rear of the cupola at the centerline of the roof. By wiggling it and pulling up on the cupola we could see it begin to lift up. We then took a flat head screw driver and pushed in on the cupola carefully at the centerline of the roof while continuing to lift up until it finally popped off. After it was disassembled, we snipped off the tabs as suggested by cjack, so that it can be lifted off easily if we need to later. My SF was really glued in. I put a screwdriver blade against it and had to tap it with a light hammer. The window broke in half, but the camera stayed in place. I Took the car apart anyway and that's the one I scavenged the camera out of. With what I know now, I could put it all back together...or put the camera in something else...and just have an SF plain caboose. My CSX was very lightly glued in all places. I figure the builder ran short of glue or something. I've got a PRR wide vision camera caboose on back order but after reading all of the previous posts, I'm starting to think that I should just cancel the order now. I just can't wrap my head around the fact that some of the cabooses work just fine while others need "fixing". I don't want to be a whiner, but why does it seem that these QC problems cannot be resolved. I can't speak for anyone here, (or anywhere else for that matter) but why is it that brand-new stuff has to be "fixed" before we get to play with it? At this point I have decided that if the caboose arrives and I have to "fix" it before it will work the way it was designed; it’s going back just as fast as I can re-package it and take it to the Post Office. Nuff Said! Ok,I'm curious to how many of you tried the App to focus the camera(per bubs post) before removing the window? I don't know but wouldn't placement of the camera to the window change the focus distance wise? 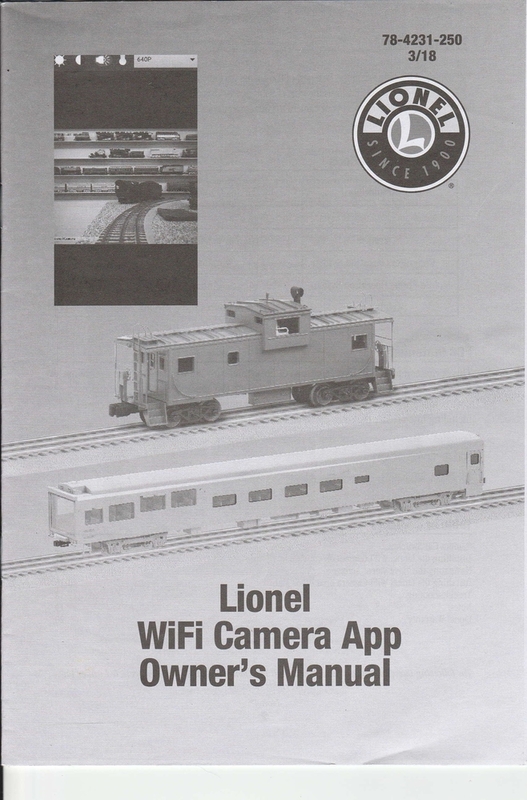 I’m thinking that App has features that the Cam caboose doesn’t have. You can adjust the resolution and shift the picture side to side or flip it upside down. I don’t see any way to change the focus, unless I don’t do it correctly. The camera is fixed in place by glue and the plastic holder. The window is a plastic toy caboose window and degrades the sharpness. I thought it might be a lens but it’s not. I think most of the Cam cabooses are ok just fine, I got three that are, but you can increase sharpness by removing the plastic window. 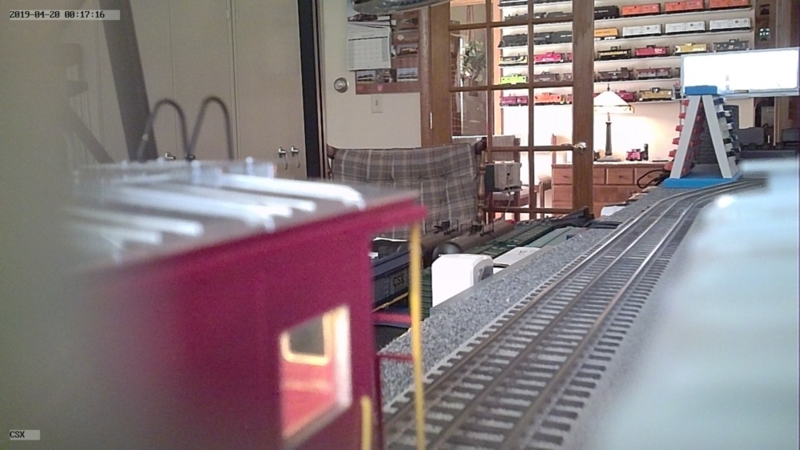 I really like this caboose cam and in fact have ordered another for my layout. I did try the adjustments described at the top of page two but it did not help with the blurry image. Even if I have to fiddle with the new one it will still be worth it. My grand kids love it and it was a real hit when I brought it to my local club. I would like to buy some more this summer to repaint for other roads not offered if my budget will support it. Repainting is very feasible now that I know how to get the caboose apart. 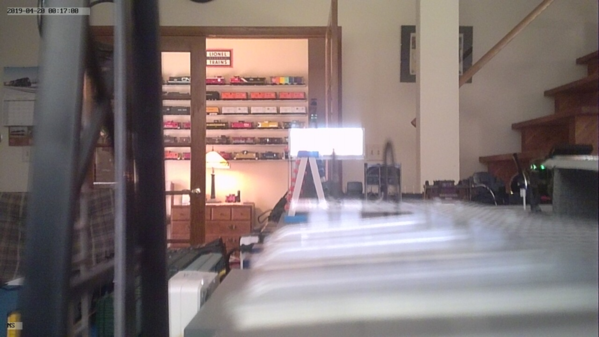 Just got my second caboose cam today from Trainworld, this one is Burlington Northern green and white. This camera view from this one is very clear with the window in place which is great news for me. I wanted to try the PC application for viewing multiple cabeese at once and was very pleased with the results. At HD both cameras worked although one of them would drop out in my tunnel. At Normal resolution both cameras worked fine with no drop out. I can't wait to take these to the local club and run both of them at the same time on different trains. Thanks Lionel for this magnificent product. You really have reinvigorated my interest which had been lagging for some time. Lol, the best QC problem... my friends scale legacy Santa Fe. The porthole lense was stuck to the bottom portion of the the upper lid. Outside the engine wrapping. To bad they didn’t include a bottle of glue.